"Are you sure this is correct?" 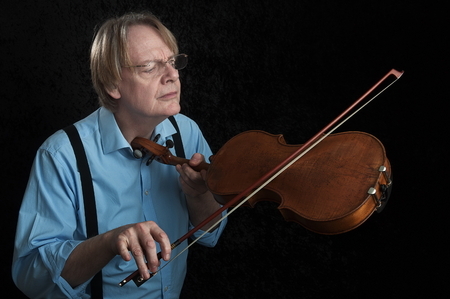 The past fifty years or so have seen a considerable advancement in Viola techniques. The proliferation of composers writing for the viola, international competitions, string quartets and festivals, have had a dramatic affect on viola playing techniques, which in turn has led to many more fine violists. At the higher levels viola technique today is as demanding as its closest violin relation. Whereas the violin pedagogy of technical repertoire spans three hundred years, original highly technical material for the viola has spanned less than a century. 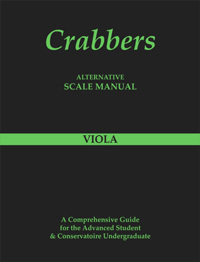 For the purposes of this website, and for further use of the Crabbers Scale Manuals, students should perhaps look into a few of the following areas to further their knowledge and inspiration. The following is a highly effective list to increase the technical potency of viola techniques: Bruni Tenor Method, Campagnoli Forty two Caprices, Herman Op 22, Hoffmeister Studies, Fuchs Fifteen Character Studies, Watson Forbes Daily Exercises, Lukacs Exercises in Changing Position, Chris Toon 12 Modern Studies for Viola 1985 & 6 Modern Studies for Viola 1993, Derek Bourgeois NYO Audition Studies 1988-92 (the difficult ones). Of course there are the essential violin studies and caprices arranged for the viola of: Sevcik, Kayser, Kreuzter, Mazas, Rode, Fiorillo Gavinies and Paganini. The arrangement of Dr. Dounis many excruciating exercises developing co-ordination and strengthening of the left hand, will further develop many other aspects of viola playing techniques. For the viola student viola diminished sevenths and viola dominant sevenths are further intervals that help balance, strengthen and shape the left hand. They are however, mostly to be found in the compositional arrangements (many by Viola world publications) of the violin virtuosi of the eighteenth and nineteenth century. Paganini, De Beriot, Wieniawski, Vieuxtemps and Sarasate should all be attempted by the serious violist. This repertoire also covers exhaustive patterns of viola notes including viola double stops that cover extreme positions on the fingerboard. Difficult viola chords should be persevered with to broaden and secure viola techniques. The viola student however, will only be able to purchase or use their Conservatoire, University and County/City Libraries to obtain arrangements of these composers. It is unfortunate at this time that there is a dearth of free technical material to cover viola techniques downloadable from the internet.